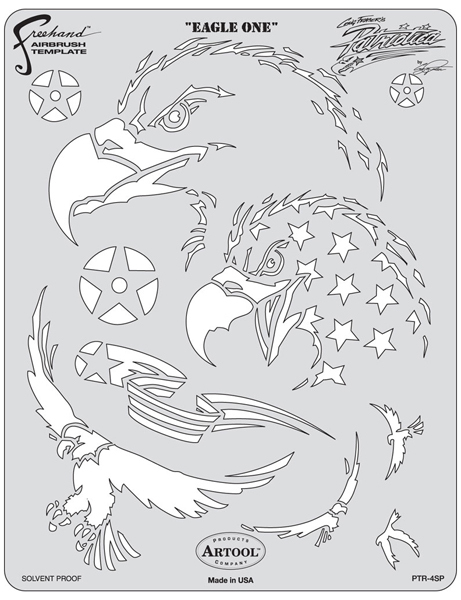 From fierce American eagles to blazing stars and stripes — not to mention some wicked skulls — Artool Patriotica Freehand Templates give you the freedom to create awesome airbrush art in virtually half the time. The templates are designed by Craig Fraser, in-house airbrusher, pinstriper, and co-designer for Kal Koncepts, a driving force in the automotive and motorcycle kustom paint industry. 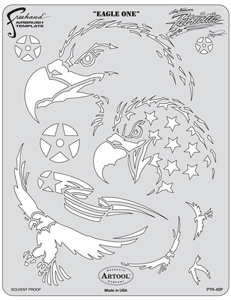 Made of tough yet bendable, solvent-proof plastic, you can flip, rotate, and flex these templates easily to create your own mad frenzy of patriotic imagery. They're a real time-saver for anyone who uses an airbrush, from beginners to experts. ®Artool is a registered trademark.® Freehand is a registered trademark. ™ Patriotica is a trademark.